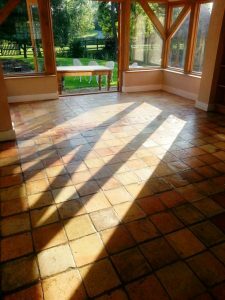 The photographs below are from a Victorian brick floor in the kitchen and conservatory of a busy farm house in the old village of Colmworth. Any sealer that had been applied to the floor in the past had long since worn off and without a barrier in place dirt had become ingrained into the pores of the brick making it appear worn, dirty and very difficult to clean. 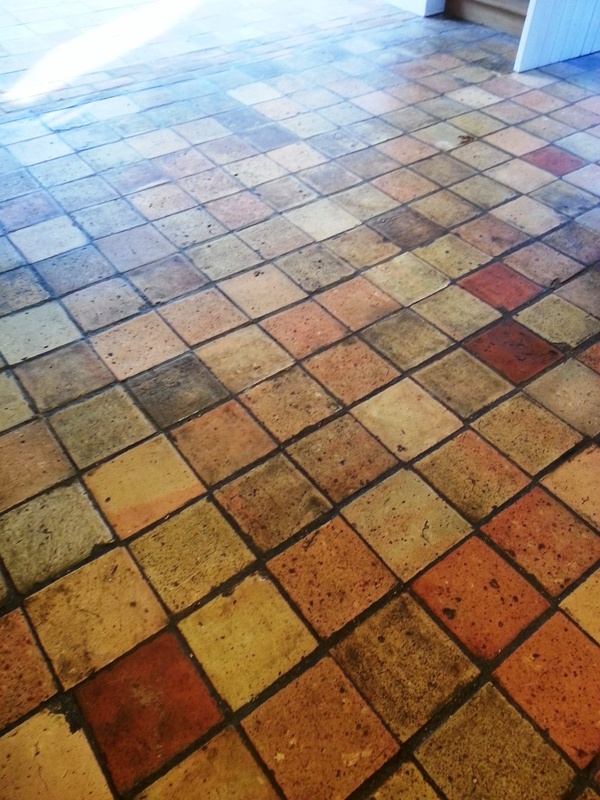 To get the kitchen floor clean I applied a strong dilution of Tile Doctor Pro-Clean to the floor and then left it to soak in for around twenty minutes; this long dwell times allows the product to get to work on the dirt. I then agitated the floor with a black stripping pad fitted to a rotary machine rinsing the floor with water afterwards which was extracted with a wet vacuum and then repeating the process where necessary. Once cleaned and rinsed thoroughly the floor was left to dry and I moved onto the next job tackling the conservatory floor in a new extension where the tiles had been chosen to match the kitchen. There were signs of efflorescence on some of the brick tiles along with concrete residue which I was able to remove using Tile Doctor Grout Clean-Up which is an acid, and once it had done its job the conservatory tiles were given a thorough rinse to remove any trace and given a quick clean using a weak dilution of Pro-Clean. After leaving the floor to dry for several days we returned and sealed the floor with several coats of Tile Doctor Seal and Go until the floor was fully sealed and the desired finish has been achieved.